One of the best electric cooktops in town, Frigidaire Electric Cooktop is trusted by many. A pretty smooth top range, the elements of this electric cooktop heat up instantly. The hot stove warning light is a fantastic feature. The price is reasonable and buying incentives are many. These Frigidaire Electric Cooktops are sleek and extremely efficient; almost as responsive as gas cooktops which makes it one of the best electric cooktops globally. Easy to install – The instructions are very clear, terse and concise. Don’t bother dismantling. The new Frigidaire comes with the connections already connected. The only thing you need to do is connect the unit to the electrical source of your house. Controls – The larger controls are appealing and can easily be removed for cleaning. All the controls have very unambiguous temperature selection stops. A delineated simmer selection comes in very handy as well. 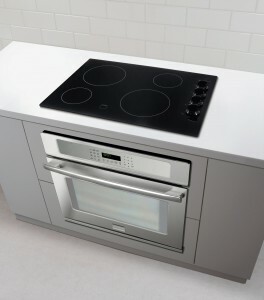 Lack of mounting options – You will need precisely cut-to-size counter top for this cooktop and even then, there are chances that it may basically suspend from the counter. This could make you nervous whenever say, four large full pots of chili are being cooked at the same time. The solution ideally could be to make a wood frame to hold it more assertively. One such review said, “My wife loves it. It is hard to keep clean but really cooks good and looks great after you clean it. I should have bought this for my wife several years ago. So far, it has been a great product. !” If it keeps the wife happy, do I need to say anything else? This makes it much easier for me to recommend Frigidaire FFEC3024LB 30 Electric Cooktop as well. Easy to install and use for the “do it your selfer”. A perfect option for those who want to go from coils to this smooth top. Great value for the price. Works as advertised.